Important narrative threads investors should follow were lost in the confusion over a recent change in its accounting estimate. Last week, United Natural Foods, Inc. (NYSE:UNFI) shares fell more than 14% in the trading session following the company's June 6 release of fiscal third-quarter 2018 earnings, largely on investor concerns over gross margin. The stock has recouped only a couple of percentage points to date. 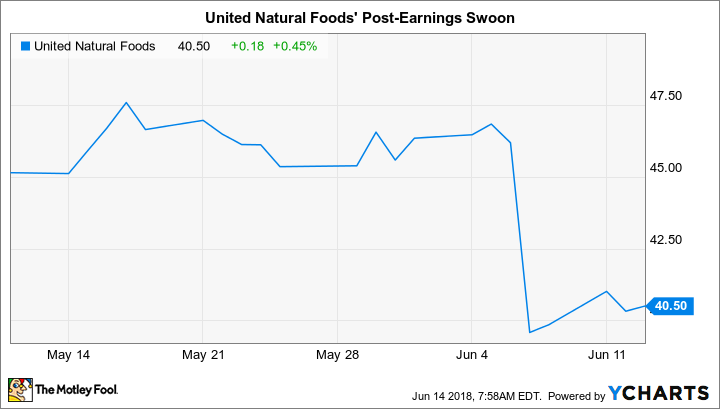 United Natural Foods' drop was catalyzed by the effect of a change in an accounting estimate on gross margin, and selling was exacerbated by a difference in how management and analysts on the company's earnings call viewed the estimate change. Let's look at this issue, along with a few other story lines that were quite worthy of shareholders' attention but were overshadowed by margin worries. During the third quarter, United Natural Foods changed the way it estimates liabilities associated with inventory purchases. The company typically accrues a liability in instances in which it receives inventory before getting an invoice from a supplier. Due to the organization's growth and the large number of stock keeping units (SKU) it handles, not all inventory received eventually gets matched to the amounts accrued in these situations. After performing an analysis of its inventory accrual this year, United Natural Foods determined that it could reasonably estimate the outcome of partially matched invoices upon receipt of vendor invoices. Previously, accruals related to partially matched invoices typically stayed on the company's books for 12 months or more. Thus, management changed its method for estimating inventory accruals, and adjusted current-year numbers in the third quarter to show a reduction of accounts payable of $20.9 million and a pre-tax benefit on the income statement of the same amount. If you ignore this adjustment, United's gross margin of 15.41% in the third quarter of 2018 was virtually unchanged from the prior-year period gross margin of 15.46%. However, if you back out the benefit of the change in accounting estimate, gross profit in the current quarter is reduced from $408.1 million to $387.2 million and gross margin declines to 14.62%. During the earnings conference call, several analysts attempted to make this very point -- that when the one-time benefit is removed, gross margin actually dropped during the quarter. Management differed with them, arguing that a reduction of a liability due to a more accurate estimate benefits both the current year and future periods. In other words, in management's eyes, there isn't a real "benefit" from the accounting change; the accrual is simply more accurate now. In this view, gross margin was actually better during the entire year, but it's only been recognized in the third quarter with the related accounting adjustment. Now, if you're somewhat confused, I don't blame you. Analysts were themselves baffled by management's particular take on the effects of the adjustment, and most of the question-and-answer session on the earnings call was taken up by this tussle. Whether you agree with management's perspective or that of the analysts who follow the stock, the back and forth only exacerbated United Natural Foods' double-digit drop the next day -- all over less than 1 percentage point of gross margin. Lost in the confusion of the call were several items of note. First, United continues to see pressure on its supply chain due to its growth. Net sales during the third quarter improved nearly 11% to $2.65 billion, but according to management, supplier out-of-stocks created an unfavorable impact of 150 basis points versus the prior year. This means that suppliers' inability to completely stock and ship items requested by United Natural Foods' customers resulted in nearly $40 million in lost sales during the last three months. I've recently discussed both the causes of and remedies to this "good" problem on United's hands. At least in the current quarter, the organization showed sequential improvement from the second quarter's 250-basis-point impact from supplier shortfalls. The company also announced that it's initiated e-commerce fulfillment activity at its Midwest center in Racine, Wisconsin. As retail grocery shopping evolves beyond the traditional shop-in-store experience, United Natural Foods is racing to fulfill its grocery partners' digital commerce needs. It's also capturing opportunities to work with independent retailers and online-based natural foods storefronts. During the call, CEO Steve Spinner summed up the organization's e-commerce strategy by saying, "We remain focused on growing our e-commerce business, and for background, UNFI's e-commerce business consists of delivering to e-commerce and secondary e-commerce providers, delivering to consumers on behalf of brick-and-mortar locations looking for endless aisle fulfillment, and to alternative channels that want our unique assortment through our Honest Green easy options website." A final item that shareholders shouldn't miss is an update on business conditions with Amazon.com's (NASDAQ:AMZN) Whole Foods subsidiary, United's largest customer. The organization recently extended its contract as Whole Foods' largest supplier through the year 2025, and its business has continued to experience growth since Amazon acquired the natural and organics food retailer in August of last year. In the last three months, sales to Whole Foods expanded more than 24% versus last year. The quarter-over-quarter leap was the highest expansion with Whole Foods since the second quarter of 2011. During the third quarter, Whole Foods represented 37% of United Natural Foods' total sales, versus 34% in the third quarter of 2017. While some of the growth can be attributed to Whole Foods' higher traffic since its merger with Amazon, United's management also cited its own efforts to "build out the store" with its largest customer. Specifically, executives cited proactive expansion into the product categories of health, beauty, and natural supplements as drivers of the stellar quarter. To sum up the various points above, the precipitous drop in United Natural Food's share price is due primarily to near-term misgivings over profitability. But the additional items we've discussed demonstrate inherent potential that longer-term shareholders shouldn't ignore.